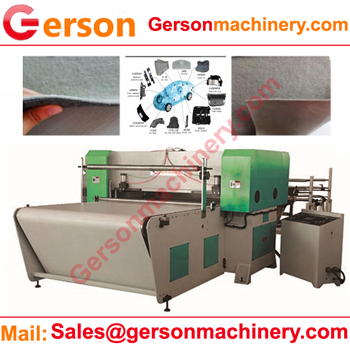 Auto velour carpet car head liner ceiling die cutting machine is one of Gerson manufacturing die cutting machine for cutting Auto upholstery fabric, Auto floor carpet, trunk carpet, trunk side trim, trunk lid cover, parcel shelf, headliner, etc. 1.The machine is not only die cutting the material for cutting Auto upholstery fabric,but also can cut out polyester non woven car interior luggage fabricric , Nonwoven,100% Polyester waterproof, single layer, multi-layer 100gsm-2000GSM,Felt, fabric, PP, EVA, XPE, GF, etc. 2.It is using 4 post ,double cylinder and top quality system to make sure the high quality of Gerson die cutitng machine. 3.The cutting press machine is very sturdy, accurate, silent and specially developed for cutting all Auto velour carpet car head liner celling ; its integrated hydraulic system makes it both highly efficient and productive. Welcome to contact Gerson for any related further information.